On the home page of the system available are statistics, in order to one could observe how much activity we made in our system to the emission mass-letters the e-mail to subscribers. We access to quantities being found in the system of sketches of the message, the quantity already sent a message (without the e-mail of test) and numbers of attachments stored on the disk of the server. Moreover we have also defined number of groups together with the quantity of addresses an e-mail. Statistics under the heading of the Account pass a message to us on the subject accounts from which we can mail a letter the e-mail. 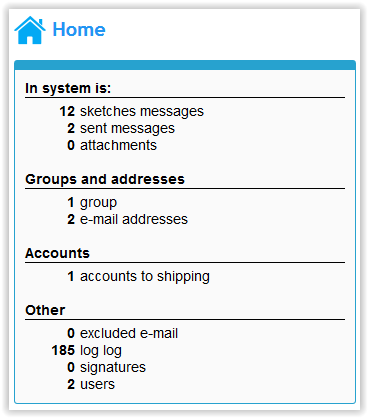 Under the heading Other are available also the information on the quantity of excluded addresses e-mail, logs of the journal, thanks to which we can check which activities and when were performed in our system, the quantity of signatures and the quantity of users having the access to the system. From the right are available popular actions which we will want to execute.